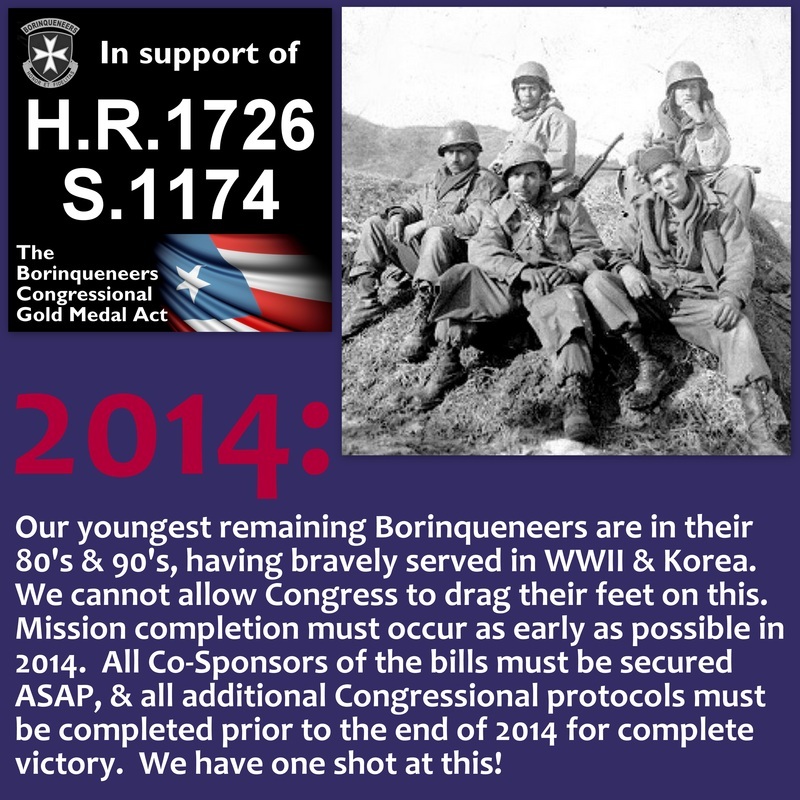 See this page for a brief rundown on some great quotes from several of our fabulous national supporters who urge Congress to pass the Borinqueneers Congressional Gold Medal Act. We are very grateful to them all! Click on the button below to read and/or download the full text of our endorsement & support letters. "Their courage and contributions in defense of our country and way of life, all while suffering humiliating discrimination and prejudice, should not go unrecognized any longer. AARP is honored to lend our support to S. 1174 (& H.R.1726)." 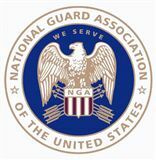 “NGAUS strongly supports H.R.1726 (& S.1174). 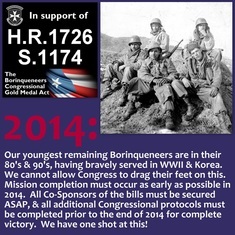 The Congressional Gold Medal would be the highest award ever for the 65th Infantry Regiment. 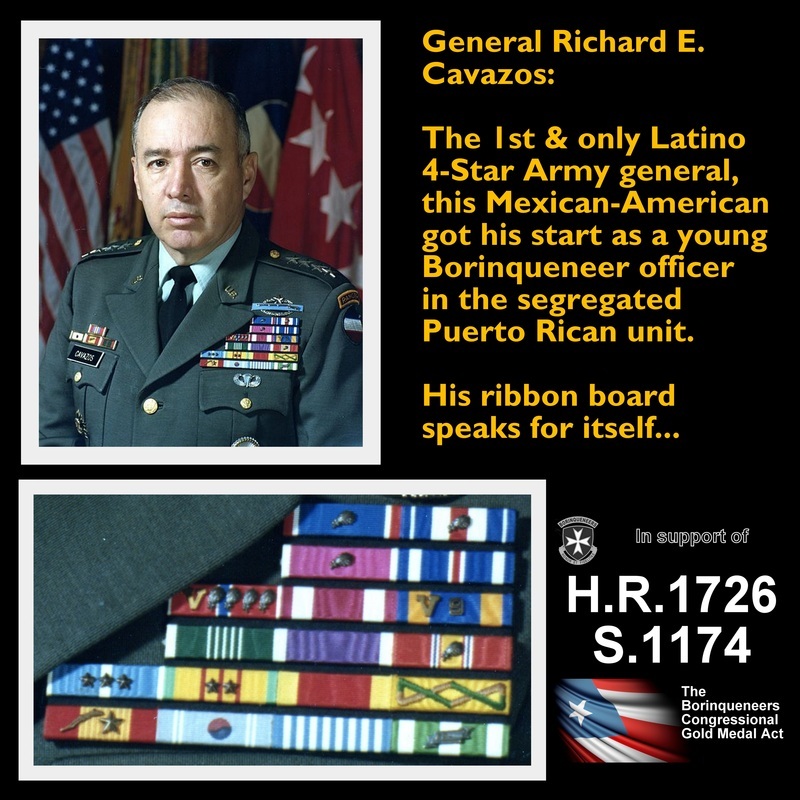 This distinction would honor all Hispanic veterans.” Note: pictured above in header are NGAUS national president General Gus Hargett & Borinqueneers Congressional Gold Medal Alliance national chair Frank Medina. "On behalf of the members, I write to add our support for H.R. 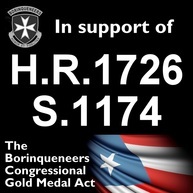 1726 (S. 1174), which would award a Congressional Gold Medal to the 65th Infantry Regiment. 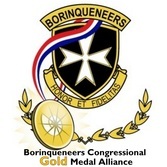 That regiment, known as the Borinqueneers, was the only Hispanic-segregated active duty unit in the United States Armed Forces and served with distinction in both world wars and the Korean War. 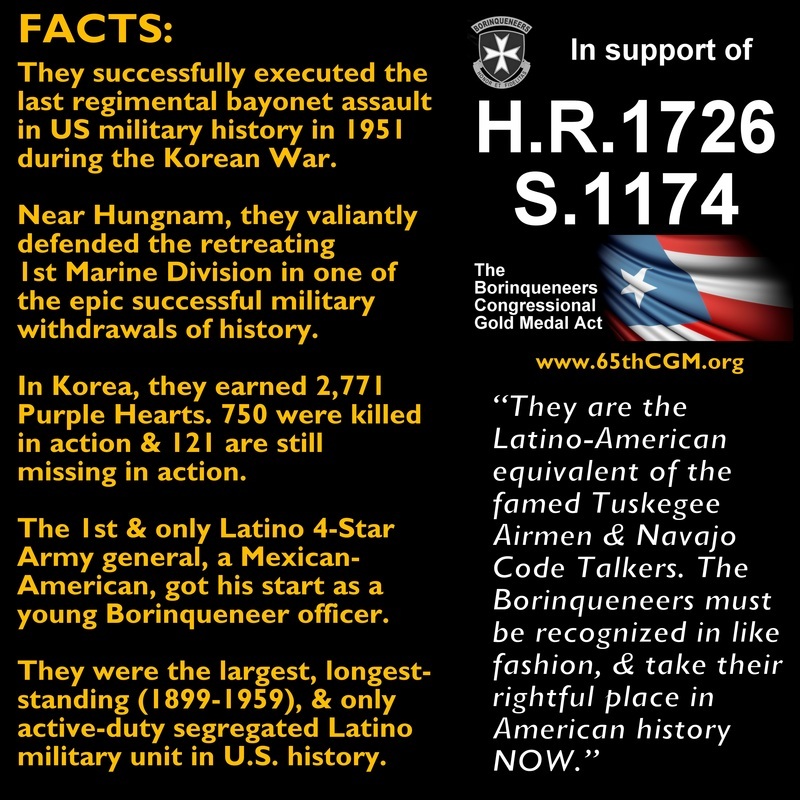 I urge Congress to recognize the service and sacrifice of this unique unit which has endured the hardships of segregation, discrimination, language and cultural barriers while serving this nation." 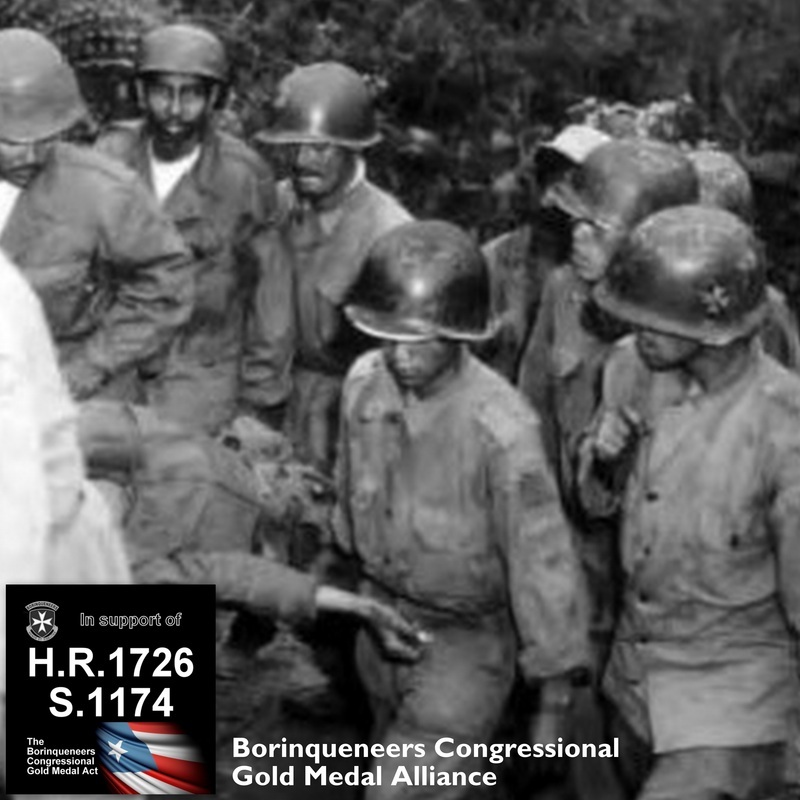 "It is with great pleasure that Puerto Rico Army National Guard supports the 65th Infantry Regiment, glory and pride of Puerto Rico in their quest to achieve the Congressional Gold Medal, the nation's highest civilian honor." Contact Congress! Click pic for details! Click on Gen. Cavazos visual to enlarge! Outpost Kelly: Click pic to enlarge! FACTS visual: click to enlarge! See what YOU can do right NOW!